A certified carbon monoxide sensor with exceptional measurement precision. It is able to detect even slightly increased amounts of carbon monoxide, which are enough to affect your wellbeing over time. With higher concentrations, the FIBARO CO Sensor will immediately inform you about a threat. The sensor will even work without being connected to the system, so it can continuously monitor the home. The FIBARO CO Sensor is a life-saving device, therefore tests to conform compliance with the applicable requirements of the standard EN 50291-1:2010 are conducted by the BSI Group accredited testing laboratory. Each sensor is subject to continuous control, which covers routine product testing and the evaluation of manufacturing quality control processes. Simple and comprehensible indicators will allow anyone to immediately assess the threat. Carbon monoxide was not detected or its concentration is extremely low, you can relax. The CO concentration could affect how you are feeling, make sure you air the room, check ventilation and find the source. CO levels are high enough to be a threat to life - follow the rules applicable for critical levels of CO concentration. Carbon monoxide is an invisible, odorless gas. This makes it particularly dangerous for people and animals alike. The dangerous carbon monoxide can also appear in your house when you are away. Thanks to the FIBARO system you will know about the danger, wherever you are. With FIBARO or FIBARO for HomeKit apps you always have instant access to the information. The FIBARO CO Sensor cooperates with other devices, creating a smart, active protection structure. Carbon monoxide can easily get into any room in your house. Place the FIBARO CO Sensor where you want your loved ones to be well and safe. Our carbon monoxide sensor may operate as a stand-alone device. Then it does not provide the features available through the system, but it is still a precise and efficient carbon monoxide sensor. You can use it yourself or give it to your loved ones, even if neither you nor they use the FIBARO system. 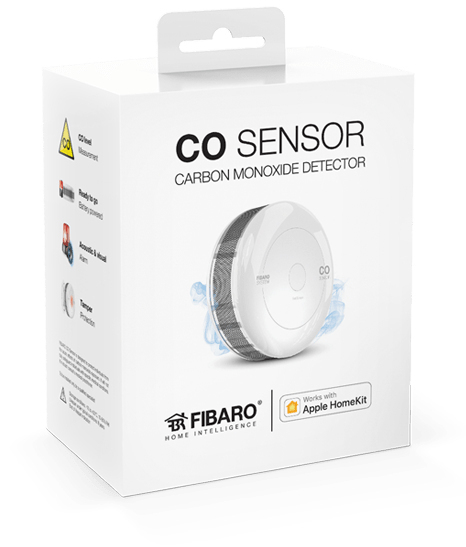 We have created a special series of the FIBARO CO Sensors which work with Apple HomeKit. The devices possess all the features of the standard sensors which are intended for use in the FIBARO System.